Stuart had arranged a family holiday with the children and his parents, but no partners - both of whom were working. We arrived at the Prom on Monday 20 December with a howling gale whipping the sea to brown and generating some big waves. It rained too, which made for a chilly dinner huddled over a gas barbecue. On Tuesday, the wind was still strong but the squalls had abated. After breakfast Stuart's parents took the children for an extended walk to Squeaky beach. We raced to the beach and rigged up. The WSW was averaging about 25-30 knots so I was well powered on the 10m kite and Stuart used his 7. I stuck with tried and tested Naish Haize twin tip as the surf was large and unpredictable. The wind was stronger at the south end of the beach. We kited the entire length of the beach, keeping clear of the swimming zone at the north end where a few surfers were out in trying conditions. Popping over broken waves was the big task. Too much speed and nosing into them meant a big stack. I popped a few jumps to. I did a couple of 360s due to the irregular take off and landed without major incident. I got worked by the surf a couple of times too. Flat sections between the waves were fun too. I didn't get right out the back as the surf was even bigger there and climbing over those waves would have been much more difficult. What a fantastic location, with a lovely long beach the spectacular backdrop of Mount Oberon. We were the only two kitesurfers out, and we had a ball. After lunch we headed back out later in the afternoon. The wind had dropped a bit and the surf was more regular, so we found it more predictable and were able to push ourselves a bit harder. I used my seat harness as I have a torn muscle near my right hip that has been bothering me a bit. The waist harness seems to stir it up. I dropped my kite while packing up after the last section. The wind picked it up and flicked it over the first dune heading inland. I dashed into the thick scrub and retrieved it. I was lucky - it only had one small hole. It could easily have been shredded. Memo to self: Never let go of my kite, and concentrate hard when packing up. In summary, Norman Beach is a great location for kitesurfing with the right wind. The scenery just can't be beaten and the surf is good. Highly recommended for intermediates and above. Here are some photos of us taken from Norman Point by Janet Webb. Torn muscle in the hip, ouch... hope it heals fast. Boris, I have lower back stiffness on my right hand side which I keep mobile with some stretches and yoga. I noticed that I was getting some tension building in the adjacent muscles on long tacks with the waist harness. It seems to have resulted in a muscle strain. My physio says to rest and has given me a couple of more streches. I am going back to the seat harness for a while - I think its easier to use. Nice pics! I've just returned from 2 weeks at Tidal River. Beautiful spot. Only problem is that it can be really gusty at times. 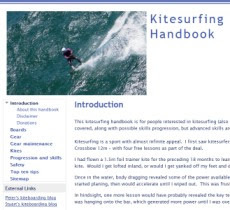 For me (beginner) there were only 2 days where it was onshore and safe enough. I did body drag with a shifting off shore and body dragged from one side to the other (about 1km)....great place!